Her shoes came :) I definitely cried when I opened the box. I lied - I cried the minute I saw the box. I'm used to the big long thin boxes my chuck taylor's came in...this box was, literally, about 7 inches long and 5 inches wide. I wanted to keep the box and mail them in something else, but I was just acting way too sentimental. Eventually, a shoebox would wind up getting thrown out or damaged somehow - and I can't keep the packaging of everything I get for her over the years. It was hard for me, but to anyone else, it's "just a box." These things fit in the palm of my hand, practically. I love them so much...it would make my MONTH if she sent a photo of her wearing them. Absolutely make my month. I don't care about how much they cost, or how much the overnight shipping cost, or anything...it'll be worth it to see her wearing them. I know, I know, I know I keep saying it, but I feel as though this worked out as best as it possibly could, given the situation. Given the fact that I miss her and want to be near her with every fiber in my body and can't be, I am so blessed to be close enough / to have her parents be open enough to let me send things directly to her, whenever and for whatever I want. OMG, so adorable! Little teeny clothing always makes my heart melt, even though my son is almost 7 now. 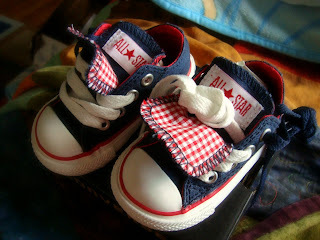 I have a soft spot for tiny sneakers...there's nothing like them! I'm happy you got to get them for her, that must be so special to you. I have shoe issues, so these are just killing me! I love them!!! Can't wait to see a pic of baby girl sporting them!